Do You Really Know What You Can Take? Let's review how much you can pack in that one liter plastic bag that you're allowed in your carry-on for airport security. What size liquids, creams, and gels can go in that plastic bag? And you are fine with either a one quart or one liter bag. ...and we use either size when we travel. Remember it’s one a QUART zip-top plastic bag in the United States, but it's a one LITER plastic bag in most of the rest of the world. You need to know this for airport security. It's so much easier when you really know what you're allowed. Security regulations for this have been in effect for several years now, and with ongoing terrorist threats, the rules are unlikely to be loosened very much anytime soon. With the focus on explosives, you are greatly restricted to the amounts of liquids, creams and gels you can carry with you on the plane. How can you pack your shampoo and toothpaste in a carry on bag? What type of bag or container can you carry them in? You don't have too many options here. No cute little plastic carrying case. What you need is mandated. √ You must use a clear, zip-top plastic bag. Yes, those plastic bags are sold by several companies, and they come in a variety of sizes. You can get bags sold by specialty companies, or one quart bags that come in some new suitcases, or you can just use the zip top one liter plastic bags (or quart bags) that are sold in grocery stores. Not unless they're the right size. √ Your containers (that's right... the containers themselves!) must be 100 ml or 3.4 oz ... or less. √ You must use small containers that only hold 3.4 oz or 100 ml when full. 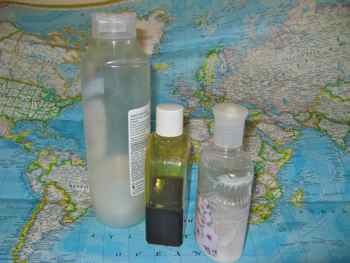 3 ounces (oz) is approximately equal to 90 milliliter (ml), but the rule in countries that use metric is that you can carry 100 ml bottles. In the U.S. if you have 100 ml bottles, they will usually be allowed. That's 3.4 oz and the TSA says 3.4 oz on their site now. √ You must use only one bag per traveler. If you are traveling with a friend or loved one, you can "share the space" in the two bags the two of you will be carrying. We tell you about how we pack our one quart plastic bags for the two of us. When packing medications, you may carry larger amounts of necessary medications, and they don't have to go into your one liter plastic bag, but you must declare them at security. As of this writing, things like eye drops and sterile solution are included. Baby foods may also be carried if declared. Be prepared for the rules to change when there are terrorist attempts. You may run into different rules at different airports... and the rules can change depending on your destination. What you carried on last time may no longer be allowed. We've seen this happen recently, and it will probably happen in the future. If you can't live without larger amounts of liquids, creams and gels, then check your luggage. You can carry as much as you want and not worry about that one liter plastic bag. Yes, it can be frustrating, and yes, it may try your patience, but there is no use fighting it. Pack your carry-on liquids, creams and gels in a one liter plastic bag (or one quart plastic bag) for now and remember how much fun you're going to have on your holiday.